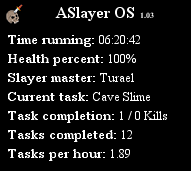 ASlayer OS - Complete Slaying script. Supporting all Slayer masters, tasks, and more! 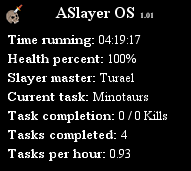 ASlayer OS is the next generation of slaying scripts and it's designed to provide you a hassle-free slayer training with emphasis on keeping your account as safe as possible. With this in mind, the script uses custom algorithms to decide what monsters to fight and where to fight them for a set slayer task. It selects the most appropriate monster to fight based on selected combat style, your combat level and slayer master, from which you got the task. The script will also switch monster locations, if a better alternative is available (e.i. it will fight monsters in Stronghold slayer cave if you have been assigned a task by Nieve). There are multiple locations set for each monster so that each player is assigned a different, random location, which is saved between script runs to provide and act as a strong antipattern. *except Green dragons, Terror dogs and Scabarites (coming soon!). Add the script on SDN (link). Make sure you have some Rings of Life or the script will stop! Once done with the setup, start the script and enjoy! - Fixed stronghold of security portal issue. - Added support for stronghold of security door questions. It's now available on the SDN. on fresh level 3 don't have any teleports and i used my home teleport. it just kept trying to spam it while going on task to goblins instead of just walking there. - Fixed home teleport spamming. - Fixed Taverley dungeon entrance. - Fixed Stronghold of Security door chatting. - Updated Draynor village sewer entering. - Fixed Kalphites rope issue. - Updated Lubmbridge swamp dungeon entrance. It should now properly take rope and light source. Do you always need to bring rope to enter Lumbridge swamp dungeon or just once? I'm still looking into the Burthorpe gate issue. For birds can you have it do seagulls in port sarim? they're the best bird exp for low levels. Just saw this, congrats on release! Why is turoths a 100% ban if i may ask? - Fixed Dwarven mine stairs. - Fixed Stronghold of Security door chatting by removing HTML elements from chat text. - Home teleport using should now be fully fixed and it should no longer spam it. I'll check them out and add them if it seems reasonable. Why would they have a 100% ban rate? I've fixed all issues except the kalphite and lumbridge swamp entrances. I'm still working on those two.